It was definitely one of “those days”. Kick if off with a way too early coffee meeting that has you showing up to the office with your hands already twitching. Next, jump into a project exploration meeting with a partner. The kind that that leaves you looking at a whiteboard that makes about as much sense as a MIT advanced quantum physics equation. Then, jump out of the office for a quick lunch-time chiropractic adjustment. Go through some emails and phone calls–standing, of course–to take advantage of when Daniel Pink says my Chronotype should be doing administrative tasks before finishing the day with a couple more partner meetings. Many of you dads have probably experienced what happens next. I’m pretty sure this is what King David means when he describes “the valley of the shadow of death”. There’s this small window of time when your “whole day” transitions to “the rest of your day”. You and your wife carry a whole day’s worth of investment, communication, work, stress, conversations and more into this abbreviated transition that should take an hour long counseling session, but instead is crammed into 30 minutes. Yea. That was this day. And the transition was way too fast. Quick, change diapers before small group! Did you print the notes? Are we bringing a side or dessert? Which one of the twins is screaming? Get your shoes on! Wait, I already changed that diaper. No, I do not know where your dancing monkey is! The dog ate it? EVERYONE STOP! The picture with this blog is NOT the story of some epic family vacation. It’s not a fun little excursion that was part of a family camping trip. It’s not even a fun, relaxing weekend adventure. It was a simple way to survive “the next 15 minutes”. It also happened to provide one of the most amazing analogies of my short, 5-year adventure into fatherhood. The first lesson I learned from this experience is about Mission. I don’t know if it is a swelling vein above her eye, the strain in her voice, or clenched jaw, but I know urgency in my wife when I see it. Tragically, I so often let my urgency slip when it comes to parenting. With all the time-sensitive things in my life–bills, oil changes, contracts, sprinkler timers, etc–I frequently lose sight of how urgent every moment is with my kids. I do all the math in my head on how many years, months, days and hours I have with them and somehow convince myself that THIS MOMENT isn’t that important. But today, right now, I have an urgent mission to remove the kids from the house, get them far away and keep them entertained for the next 15 minutes… or else. Once I’m in the garage, I know my time is short. If I don’t have these three little girls locked in for the next couple minutes, there’s no telling where they’ll end up. This brings me to my next “Aha!” moment of this adventure: Preparation. I credit my beautiful twin girls for teaching me this value.The first few months of navigating nighttime diapers, meals, burping and swaddling on a 90 minute rotation makes you realize that it is impossible to be too prepared. In fact, that season of my life birthed one of my favorite sayings, “Prepared, but never ready.” This day, in the garage, fleeing our house with my three girls, taught me something I’m still trying to get through my skull: prepare WITH them, not just FOR them. Given that I was improvising this whole hair-brained adventure on the fly, I needed help. First, I recruited my 5-year-old. Still, I realized I was in over my head. Four pairs of shoes, four helmets, two hardware attachments, two safety flags, one tightened handlebar, two low tires, three sets of buckles and starting one exercise routine on my apple watch had my head spinning. Reflecting on this moment after, I realized that I so often compartmentalize and separate the preparation from the experience. This was a huge reminder of two things for me. First, when it comes to my parenting, just showing up is not enough. If this adventure is any indicator, preparation is about a third of the battle. Second, I need to realize that preparation IS the experience. Over the past couple weeks, inviting my oldest into the planning, strategy, set up, packing and preparation of our adventures has been a revelation! So here we are, on the driveway, ready to embark. First things first, backing up this dad train makes semi trailer parking look like child’s play, so that took a little bit to figure out. The next thing I discovered was even tougher than that: Communication. I still remember the first time my wife and I rode a tandem bike. To give you a better picture, we are both first-born, hard-headed leaders, so we were bound to have a wonderful time figuring out that dynamic. Clearly, I didn’t think through what it would be like to have three mini versions of her sitting behind me. For you dads with multiple kids, you know those moments when you are receiving two, three or four questions–or demands–at the same time and your brain has no way of processing the information in a way satisfactory to all parties? Now picture that while you are struggling to breathe, cars are flying by you, dogs are barking across the fence and you have a little smudge in your sunglasses. Rule number one in tandem/tow biking? Yelling instructions to those behind you really loud while you continue pedaling is like trying to blow bubbles into a leaf blower. Rule number two in tandem/tow biking? Turning your head slightly to yell instructions to those behind you increases your effectiveness by a whopping total of 0%. I’d love to tell you this communication experience revolutionized the way I practice this in everyday life. Sadly, all it has done is reveal how deeply this tendency is rooted across 100 other areas of my life. It is a simple principle: stop, get off your bike, connect with each person, collaborate and move forward together. And then repeat this again and again until you arrive at your destination. There’s one final moment that taught me my last lesson of this adventure. I finally hit a stretch of road that I’m pretty sure was the only portion of the trip that was downhill. It was kind of like one of those old stories your dad used to tell you about walking to school in the freezing, wet snow, uphill both ways. Anyway, we hit a moment to coast and I started to relax a bit when I noticed a difference in the shade of pavement in front of me. Just in case you were wondering, the handbook for evasive driving maneuvers for tandem/tow biking is one line long: objects in front of you should not be in front of you. Before the suspense of this moment kills you, I will inform you that we are all very healthy. In fact, this isn’t a dangerous surprise at all. This surprise made the entire experience for us. All it took was a misaligned sprinkler. Two, three and four passes later, the screams and squeals coming from behind was enough to cement the last lesson in my head: Enjoy the Ride. As crazy as it may get when the twins are wrestling each other in the caboose or my oldest is content to take it easy while I huff and puff my way up a hill, I can’t help but take advantage of every moment and welcome the wide eyes, gaping mouths and hysterical laughs as we cruise by all of our neighbors. I’m already planning the next time I can try and duplicate this adventure. In fact, I’ve started scheming how I can add a baby seat to the back of my bike for next summer after we welcome our fourth into the family this February. Tandem/tow biking is quickly becoming a consistent metaphor for my life as a dad. Even when I slip up and forget the urgency of my mission. No matter how many times I miss something in my preparation, or how frequently I bumble through messy communication. 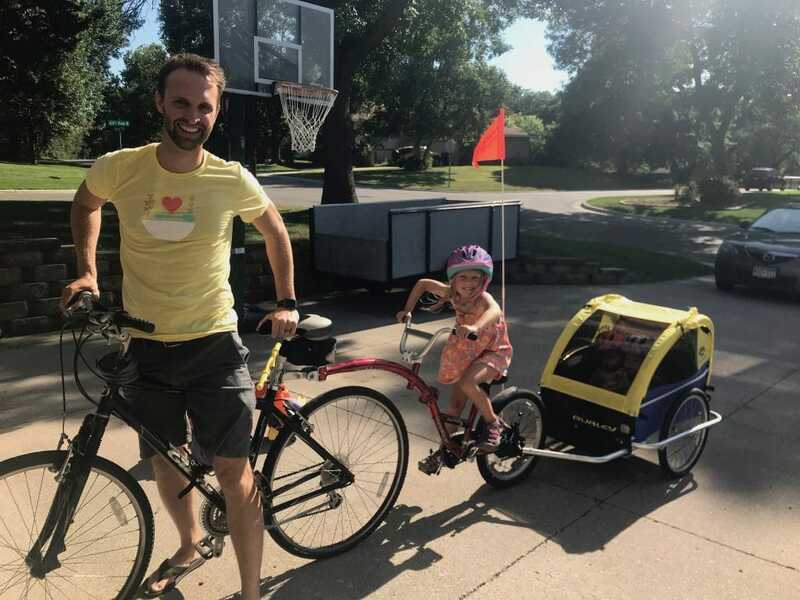 Despite the times when I can’t get over my own pride and stubbornness to stop and enjoy the ride, there is one message I want my family to hear over and over: Hop on the Dad Train! I want them to know that I’m going to carry them. That I want to go on adventures with them. That no matter how many times we have to stop, we will make it to our final destination. That there is always time to go through the sprinkler again. And again and again. Kids. Hop on the Dad Train. We’re going for a ride!